__buildDialog: This private member function tediously builds the dialog box. Below shows a graphical part-by-part building of the dialog box. Because the color sliders change the properties of the visualization pipeline, the function addSliderCommandBinding must be called in order to override the default command binding of the slider. In this manner, this new function named __doUpdateColorLabelsEtc will have to take care of the basic functionality in addition to updating the pipeline. (There are better ways to do this, but the author did not implement them). Similarly, the same case occurs for the opacity slider. Here, the update function is __doUpdateOpacity. __doUpdateColorLabelsEtc: This private member function will obtain the current values of the sliders, update their adjacent text labels, send a specially formatted string consisting of the hexadecimal values for red, green, and blue to the “color label”, and then update the appropriate isosurface depending on which radiobutton (skin or bone) was selected. Also note that *unusedArgument is used to get around a mismatch in the parameter count even though this parameter is not used for anything. # "An Introduction to Tkinter". __doUpdateOpacity: This private member function will obtain the current values of the opacity slider, update its adjacent text label, and then update the appropriate isosurface depending on which radiobutton (skin or bone) was selected. Equally as important, it will set its current slider values to values in a hash table so that when a different isosurface is selected, the last correct values can be retrieved. Also note that *unusedArgument is used to get around a mismatch in the parameter count even though this parameter is not used for anything. __doSetSkinTissue: This private member function will retrieve the RGB and opacity values from the skin tissue hash and set the slider values with its last settings. This function will also call the function __doUpdateColorLabelsEtc to update the isosurface if necessary. 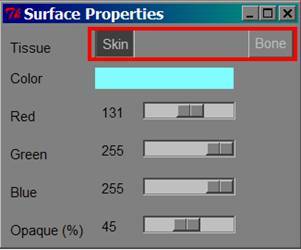 __ doSetBoneTissue: This private member function will retrieve the RGB and opacity values from the bone tissue hash and set the slider values with its last settings. This function will also call the function __doUpdateColorLabelsEtc to update the isosurface if necessary.